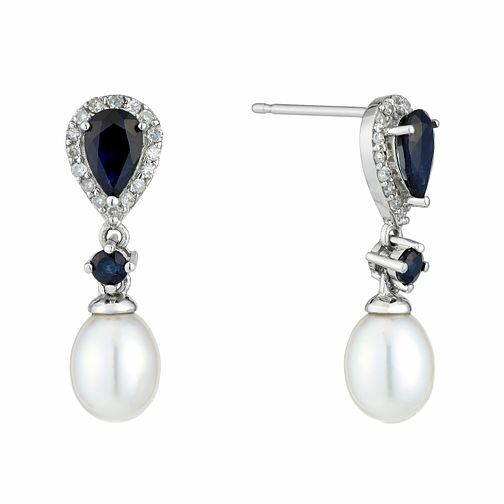 A pair of beautiful freshwater pearl, diamond and sapphire drop earrings crafted from sleek 9ct white gold. Each earring features a teardrop shaped sapphire surrounded by dazzling diamonds. Leading to a smaller sapphire, the look is finished with a single drop pearl for vintage inspired glamour. A breathtaking way to add sophistication to your outfit. 9ct White Gold Pearl Diamond & Sapphire Vintage Earrings is rated 5.0 out of 5 by 2. Rated 5 out of 5 by Anonymous from My wife loves the design This product is a fantastic buy, great quality and great value for money. Rated 5 out of 5 by Anonymous from beautiful and classic earrings I bought these earrings as a wedding gift to myself and to have "something blue". I purposely wanted something with pearls and stones, so I can still chose what kind of necklace I want to wear with it. These earrings are stunning and absolutely timeless, classic and elegant. Recommended!